It’s Halloween time and there will appear to be all manner of odd nature about. In truth, nature is no odder (or more normal) than usual this time of year but because we view it through seasonal glasses we see what we seek. In part, nature fascinates us because it fulfills and encourages our fantasies and legends. I can’t attest to the reality of witches or ghosts, but I can attest to the reality of Witches Butter and Lotus Faces. Both are real and un-real. Wow, what did I just say? O.K., let’s address those Lotus faces. 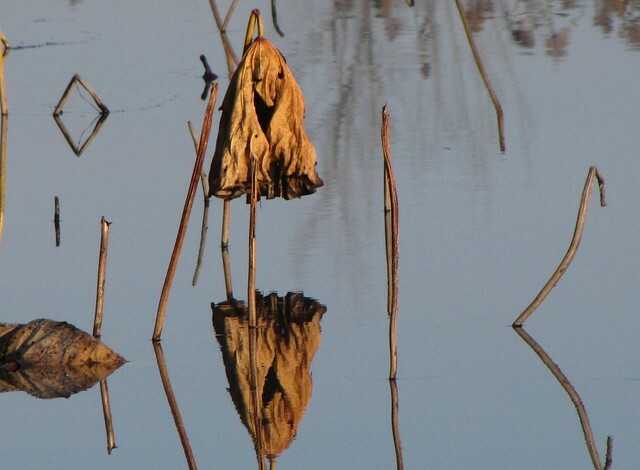 When American lotus leaves break down in the autumn they bend down to touch the water. 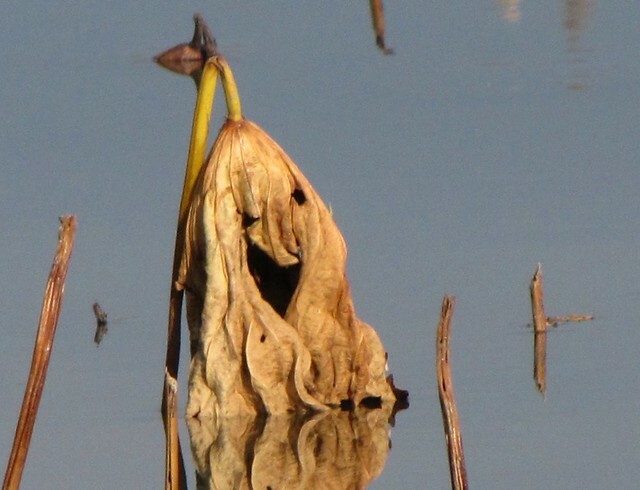 Due to the effects of breakdown, some of the leaves get strategically placed punctures in them that create faces – appearing like strange wrinkled ghosts poking out of the marsh which stare back at us like specters. No, they are not really ghosts but they are hard to ignore. I mean, we can’t control our imagination. I can’t tell you how many times my piles of clothing turned into monstrous forms in my dimly lit childhood bedroom. Pants draped over a chair were especially prone to metamorphose into lumbering ape-like beasts with horns. The forms would even appear to move if you allowed yourself to see it. They rocked back and forth and pulsated….whew, I’m getting creeped out just thinking about it. Please don’t tell me that I was the only child on earth with this affliction. 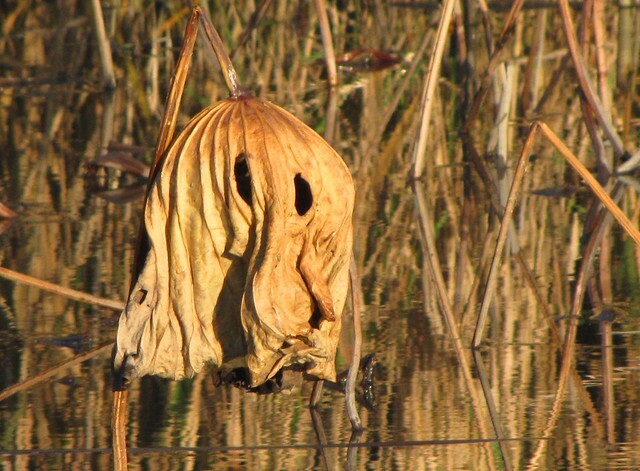 Out in the clear light of morning, you’d think something like a lotus leaf face would be anything but scary. They are dead leaves for crying out loud. But look into those eyes – or at least where those eyes used to be – and you might see them move. There, did you see that! In fact, I witnessed one of the “leaves” rise up over the surface of the water (compare beginning photo with photo below). It’s true that the water level dropped between these two photos, but that is entirely irrelevant. Now, granted, the one face appears happy. It’s almost as if the lotus spirit is joyful at its release from its above surface responsibilities. It will live on through the winter as a tuber tucked snuggly in the muck and away from the bitter winds of winter. Unfortunately I’ve seen way too many movies where a happy ghost suddenly turns evil and attacks, so I will not trust it. The second lotus spirit is just plain ghoulish. It has no mouth and possesses an especially blank stare. By day, these ghouls are frozen into place by the bright light of the sun, but who knows what happens to them at night. I will not walk by the Lotus Bed at night because I am sure they would pulsate and moan (probably with a high whispy tone). There is another reason I would not walk the trail at night this time of year. Just up the trail from these Lotus Specters, there are a few wrinkled orange blobs situated on a dead branch. 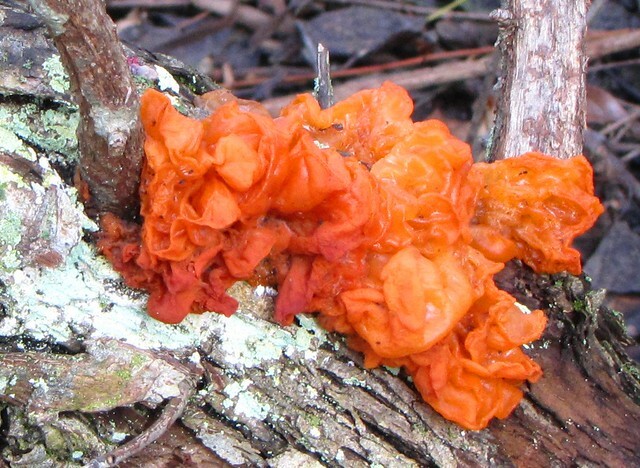 Like pumpkin-colored brains, or clusters of severed ears, the un-holy look of the Witches Butter fungus is enough to cause reflection. The jelly appearance is deceiving, however, since these things have the texture of cartilage (like severed ears – just like I said). These ear clusters are signs of rot. 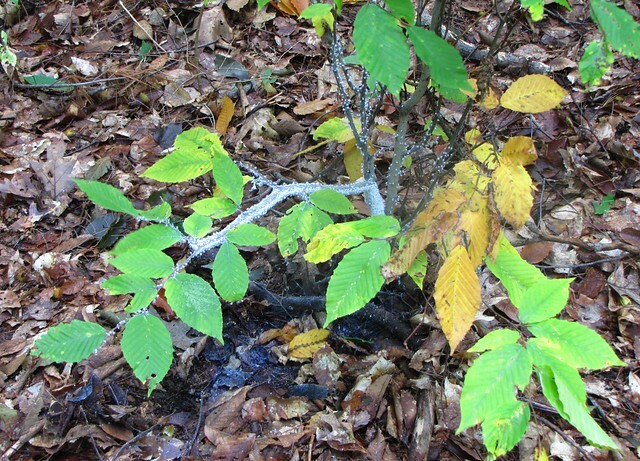 Scientists will tell you that this rot is within the decaying branch. There are thousands of threads of wood-decaying fungus working to break down this branch. 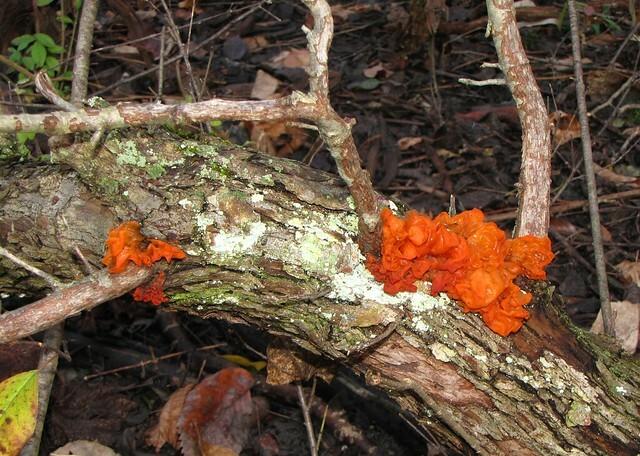 The Witches Butter Fungus is a parasite feeding upon these wood decomposing fungi. 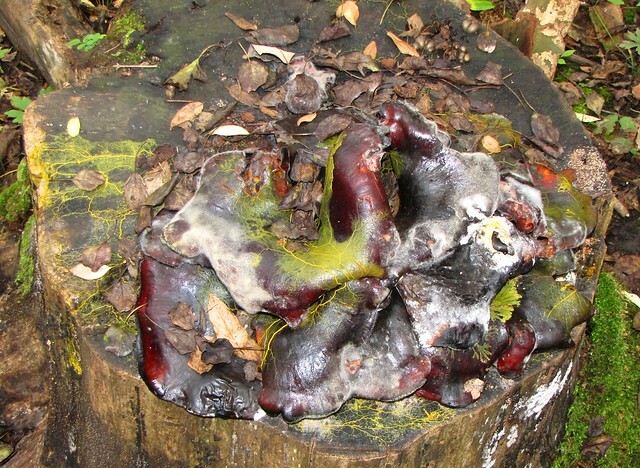 It is a fungus eating fungus – a cannibal. To those who first discovered and named this thing (and by that I mean the non-scientists) these blobs represented a rot of a very different kind. They spring up, they say, wherever witches cast their spells. Here at this branch a witch had cast some sort of evil spell. Perhaps she turned a chipmunk into a toad or a deer into a pile of pulsating night clothes. Who knows? Just to clear the air, let it be known that I am talking about bad witches here. Good witches leave piles of yogurt lying about. I do know that this fungus is harmless by day. In fact, it is even edible to some degree. It is tasteless, but is said to add texture to soup (kinda like tofu). Even at its worst interpretation, this stuff merely indicates the scene of a heinous deed, like blood at a murder site, so it is not heinous itself. Besides, witches never cast their spells in the same place twice, right? Still, I choose not to pass by this place on Halloween night. It’s not that I’m scared or anything but the thought of an acorn-eating toad creeps me out. And, let’s not even bring up those Lotus faces again. 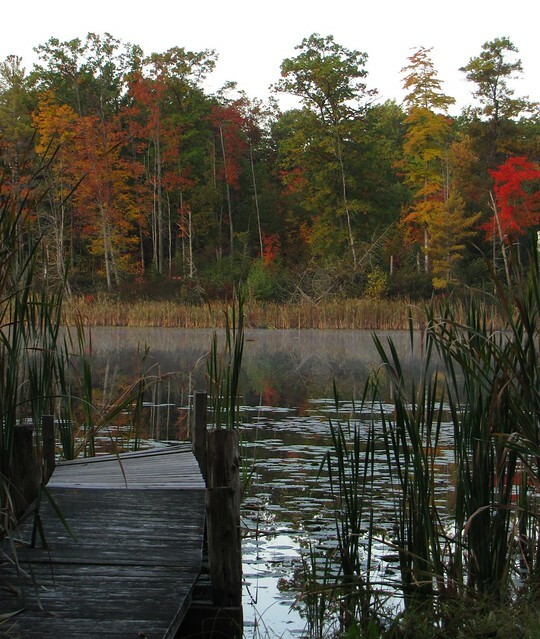 Autumn is on the wane around Dollar Lake and the brightest leaves of fall have already fallen. The oaks are just coming into their own brunt umber glory and a few crimson hued creepers are still putting on a show, but the peak is past – the bloom is off the rose – the check has been mailed. 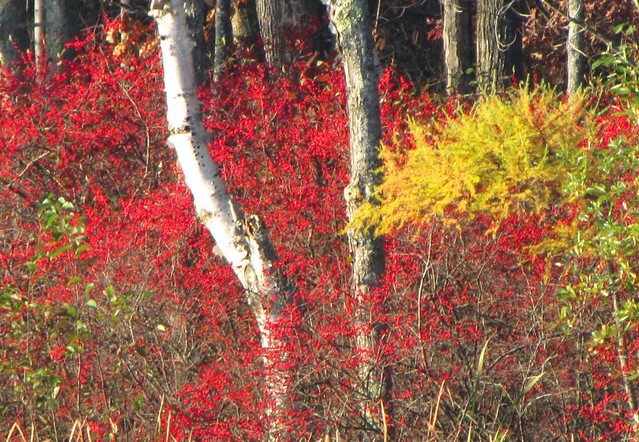 Tucked away in the swales and peeking out from the birch lined woods, the Michigan Holly shrubs are just entering their season of glory. In fact, they will be on display through the winter. I guess it depends from where you hail as to what you call this plant. 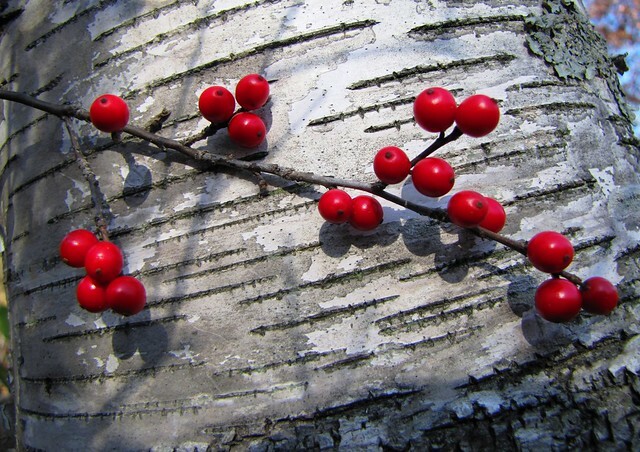 In some parts it is called Black Alder and in others it is named Common Winterberry. 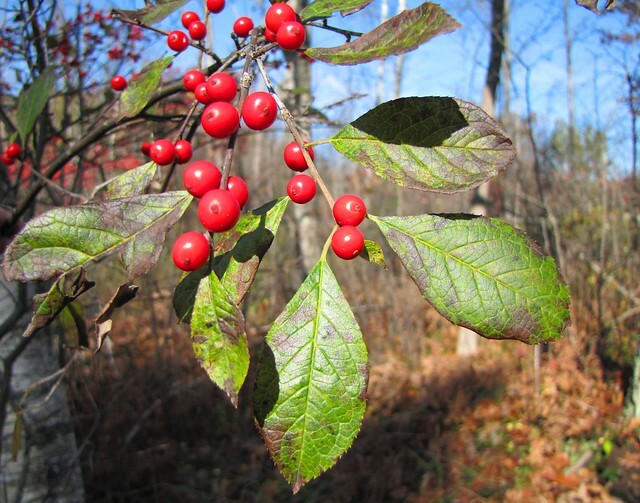 In Canada it is called Canada Holly and it is probably no great leap of logic to assume that the name Virginia Winterberry originated in Virginia. If your name is Bob and this plant appears in your yard, then Bob-berry might be appropriate – not accurate, mind you, but appropriate. 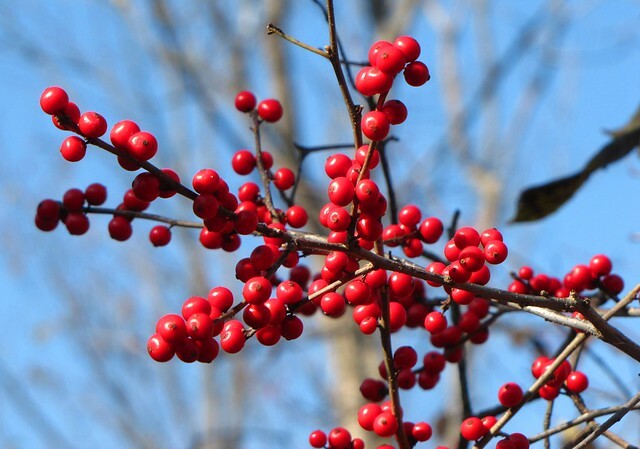 Technically, this scarlet berried shrub is called Ilex verticillata and that was the official name bestowed by Asa Gray in 1856. It really doesn’t matter, however, because in Michigan it is called Michigan Holly and, since I am from Michigan and my name is not Bob, then Michigan Holly it will be. In a way, it also doesn’t matter what the stuff is called because it is so glorious. Holly Cow! Theirs is the combined effect of a thousand points of red merging into a solid swipe of crimson when viewed from afar. The vibrant colors come from the berries and not from the leaves. As a Holly plant this one is a slight disappointment. The elliptical leaves go from green to dull purple to dead in a short time. They drop off without fanfare and don’t stick around to provide an emerald background for the red berries. That is what hollies are supposed to do right? Well, this one may be lax in the leaf but it certainly makes up for this in berriness. The leaves would only get in the way. At a casual glance, it might appear that these plants are strictly a wetland species but this is an illusion. They are known to grow in a wide variety of soil conditions ranging from wet to quite dry. 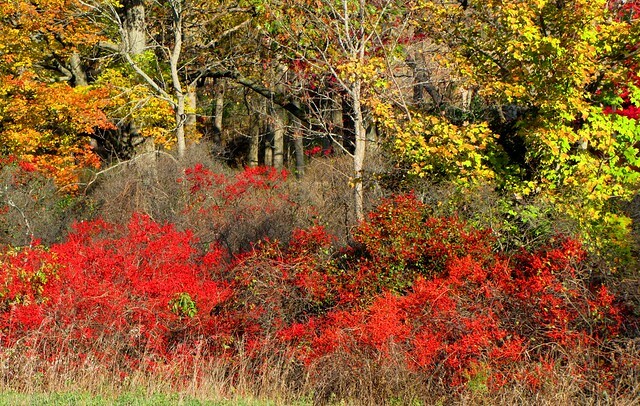 At a closer glance, you will notice that those scarlet sprigs are widely spaced when in dry woods and densely packed when in wet conditions. It is safe to say that they are at their best when in marshy swales where they will form dense thickets beneath the canopy of willow and spruce. Because the Michigan Holly is a dioecious (where the male and female flowers are born on separate plants), only the female plants bear fruit. The males just stick it out all winter secure in the knowledge that they had something to do with this. At least you know that you can refer to the berry-producing individuals as “she” and the twiggy winter sticks as “he” (or, sir or madam if you prefer). Birds especially enjoy the female of the species. 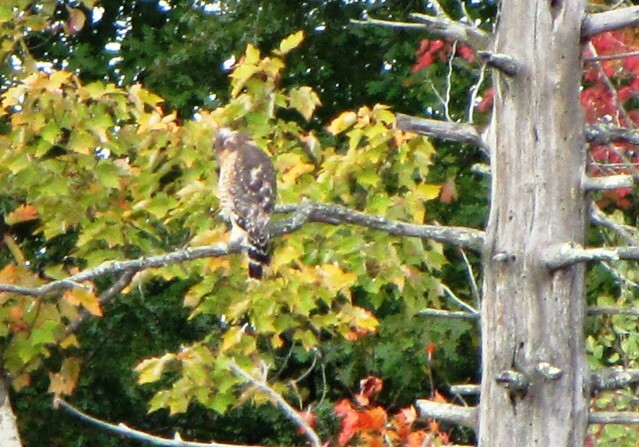 Dozens of types (48 according to one reference) ranging from White-throated Sparrows to Ruffed Grouse feast on the feminine-produced fruits. Wild-eyed flocks of winter robins are especially fond of them. I saw multiple gangs pillaging the local Holly shrubbery this past weekend. Unfortunately, you and I are condemned to admire the Michigan Holly from a distance. Oh sure, you can pop the fruits to see the gushy orange interior or try out some artsy photography on the berry clusters, but you may not eat them. Like so many other wild fruits, they are poisonous to humans. Delicious upon the eye, they are, but deadly upon the tongue. “Why would anyone dump a pile of livers on stump in the middle of the woods?”, I asked myself. Not hearing an immediate answer from within (or, thankfully, without) I stepped off the trail to examine said “liver” pile. I went closer and could perceive the yellow veins coursing about the hunks of raw flesh, yet saw that these same veins spilled down over the wood and entered into various nooks and crannies of the stump. After a silent “whoa, that’s weird” I realized these things weren’t livers at all – they were liver-colored fungi. The yellow veins that gave the pile a definite organ-like look were the dendritic tendrils of a yellow slime mold feeding on the fungus. For the second time this year I was lured in by a slime mold on a stump (recall the chocolate tube slime mold from this past summer). 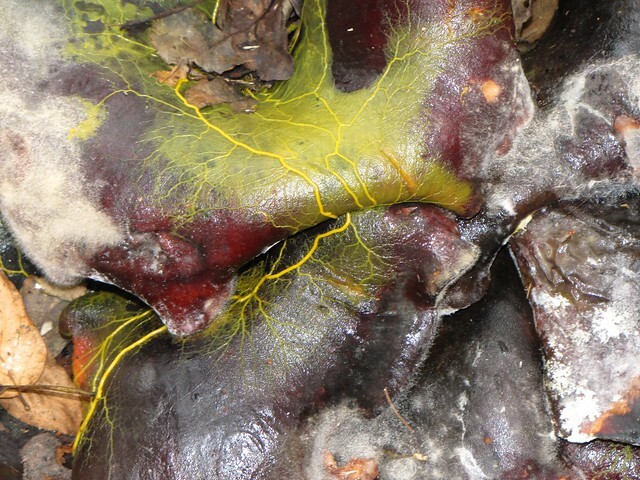 Without giving everything away, right away, this creepy yellow mat of stump veins belonged to a type of slime mold called a Fragile Slime Mold. When “fruiting” this species produces hundreds of spore cases which resemble bunches of yellow plastic grapes. To some these pod clusters look like insect eggs, so this type of slimy mold is often referred to as the Egg Shell, or Insect Egg Slime Mold. In the plasmodial (moving) phase, however, they bear no resemblance to insect eggs what-so-ever. The name still applies regardless. There is no other way to describe this particular situation (the pseudo- liver thing) without using the word “creepy.” In fact, there is really no way to talk about slime molds in general without using that word. These organisms are literally and figuratively creepy. 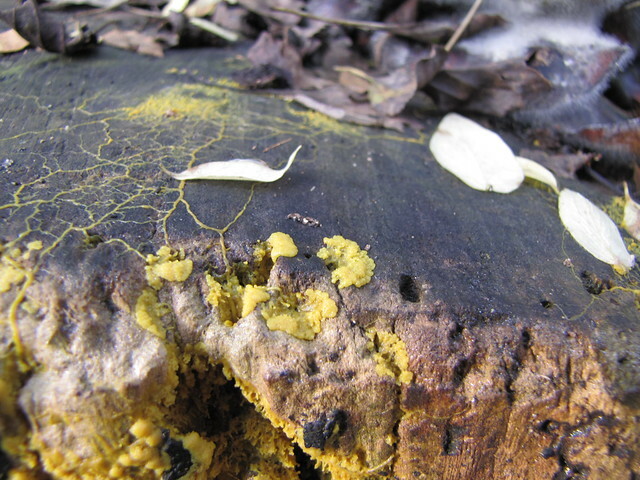 Slime molds are neither plant, animal, nor fungi. They are not even molds for crying out loud (“I’m as mad as hell and I’m not going to take it an..y…..wait, that doesn’t make sense in this context does it?). They are basically blobs of cytoplasm functioning as an amoeba colony. In other words they deliberately move about seeking nutrients. Because they move relatively rapidly, they are… well…creepy! One source described this ability to move as a chemical democracy. The detection of nutrients at one point will cause the “all for one and one for all” call to course through the being and it will send out feelers until the prize is reached. It is a non-thinking response (I know people who travel 65 mph in a similar non-thinking mode). 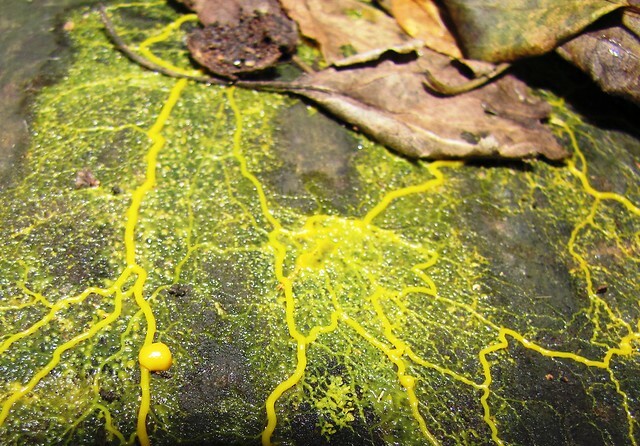 Although not land speed demons, some slime molds have been recorded moving at a rate of 1 inch per hour. 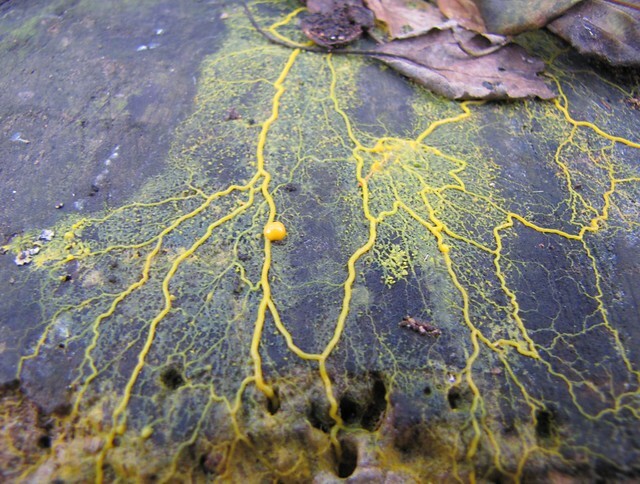 Many years ago, a slime mold actually solved a maze. Like a slow motion mouse it arrived at the “cheese” without error. Again, I say…creepy. The Fragile Slime Mold pictured here was actively feeding. Once detected, the food source is surrounded and slowly digested with enzymes. One of the characteristics of this species is its tendency to spread out into bright yellow net-like reticulations. NOTE: I invite you to read the following, and final, paragraph in your best (internal) Peter Laurie voice. If you are not alone, but want to be, you can perform this exercise out loud. Only hours after a heavy rainstorm doused the landscape, when it was safe from the drying effects of wind and sun, the plasmodium oozed out from the stumpy crevices and proceeded to take sustenance from the large rotting liver fungus. Twenty four hours later (see below) only a few snaky tendrils remained. The satiated creature had withdrawn back into its dark moist lair. All evidence of its existence was completely gone by the third day. But, it will be back (cue the synthesizer and end with a veiny yellow blast accompanied by Psycho music). I wasn’t out to prove anything really. The day was getting long in the tooth and there wasn’t time to mount an expedition to the great outdoors, so I ventured out into my own back yard. We have an acre and a half with a sluggish “county drain” stream coursing through it. I try to keep at least a third of the property in wild state and a good portion of my wild blog material comes from there. Mentally I always challenge myself to find something interesting within my little kingdom. This time I only took a few steps before spotting something of potential value within the realm. A small insect, perhaps a half an inch long or so (about 13-14 mm for you Canadians out there or about two M & M’s for the rest of you) was perched on the siding. 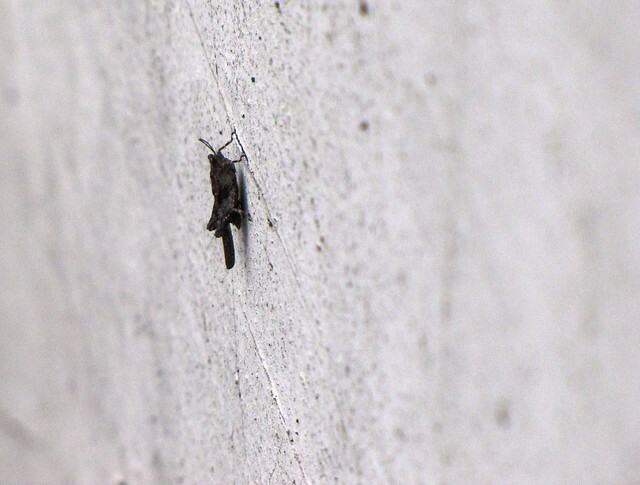 A small bug is hardly newsworthy on an average day, but this one appeared to be a grasshopper. As a rule, grasshoppers are in the medium to large end of the insect spectrum. They start out tiny but soon attain sizes well over an inch when mature. This example had the chiseled features of an adult grasshopper combined with the petite size of a nymph. It was, in other words, a Danny Devito among grasshoppers. I had never seen such a micro-hopper before and was willing to bet that you (those Canadian and M&M eating readers out there) had never seen one either. So, I snuck up as close as my close up lens would allow, snapped as many shots as I could, and succeeded in frightening the thing off. It launched off the wall and into the grass before I could mark its landing. It was gone for good. But, I had my photo evidence and a description and that was enough. My minor league back yard grasshopper turned out to be a type of Pigmy Grasshopper. There are eight species in Michigan and I can tell you with all honesty that these insects were about as familiar to me as Tessellated Darters (go ahead look that one up). In other words, not at all. Sure we all know about grasshoppers and how they fly and jump, live in dry upland fields, eat grass, and die off in the fall but these little fellows break most of the rules of grasshopperdom. They do jump, but that’s where the comparison ends. Take a good look and you’ll notice that this fellow has an overly large head, a peculiar flat pad on its back, and a very long point extending well beyond the end of the body. This projection is a part of the thorax called the pronotum. On a regular grasshopper it exists as a small pad at the base of the wings, but the pygmies take it to an extreme (flaunt what you have, I guess). The wings on this species are small and relatively useless. The coloration is so mottled that it is difficult to tell where one part begins and the other ends. 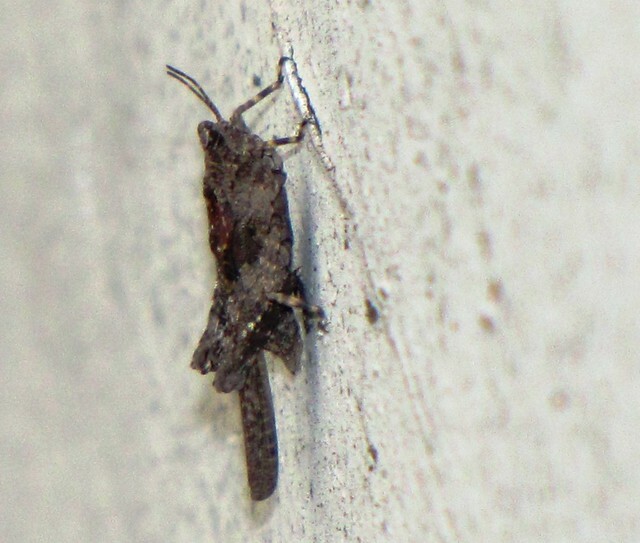 I can’t be sure, but I believe this little tooter to be an Ornate Grouse Locust. The genus name for this species, Tetrix, is Greek for Grouse. Like a grouse, the Ornate Grouse Locust is well camouflaged. Wow, don’t you feel better for knowing this? I know I do. Heck, before I walked out my back door I didn’t even know these things existed – leave alone living in my back yard. And, how about that Greek thing, eh? But, that’s not all! There’s more. You Canadians have certainly heard the fable of the ant and the grasshopper. You know, the one where the grasshopper fiddled about as the ant labored feverishly to put away food stores for the winter. When winter came, the grasshopper begged food from the ant but was turned away to die in the cold. This fable reinforced the values of hard work and taught you to never let a talking grasshopper into your home. This tale also paid homage to the fact that all northern grasshoppers die in the fall (only their eggs carry on into the following year). 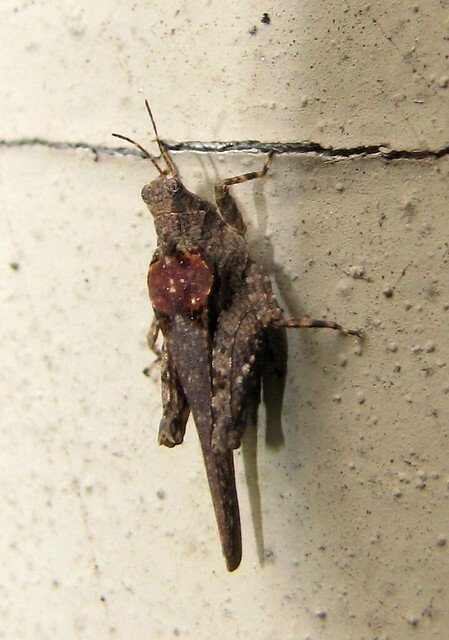 Well, in the amazing form of the pygmy grasshoppers you have a group of hoppers that actually overwinter as adults. They breed in early spring and some of them may live two or more years. Ants smantz! Now, before you shake your head in wonder and disbelief, there’s more. Save that last jaw drop for this last set of facts. Grouse Locusts favor wet areas and feed on algae and organic material found in wet soils. This is not your typical grasshopper fare or habitat, but then again this is not your average grasshopper. I’m not saying that this species does it (it has been implied, however), but in other parts of the world these guys are reported to actually jump into, and swim, underwater to escape. That definitely is not a grasshopper thing to do, but then again these are not your avera….wait, I already said that didn’t I? Please excuse me for getting so excited by a bitty bug. It’s just so nice to know that there is such an anti-establishment beast out there and that good things do occasionally come in small packages at your doorstep. It was an unusual morning right from the get-go. It is customary, when at Dollar Lake, to drink our morning coffee out on the porch. There is no better way to start the day than to watch the fog lift off the still waters and witness the first rays of the rising sun strike the upper portions of the trees on the opposite side. It had been raining hard all night, but the daybreak looked promising and the clouds were parting somewhat. Upon grabbing my shoes to head outside (I am not a slipper person), I was surprised to find an acorn in the left one. Needless to say, it was not there when I took them off the previous night. You don’t just get a large nut in your shoe and not notice it (like having an elephant in your pajamas). Because my shoes were inside the cabin, we can rule out a natural nut fall. No, this acorn was apparently a gift from the resident Deer mouse – a polite little creature that sticks to the high shelves and midnight corners inside the cabin. The mouse had plenty of opportunities to gift such an acorn in the past, so it was odd that he chose this particular morning. He usually eats them and leaves the empty shell husks somewhere. In retrospect, the distinctive odor issuing from such a piece of human wear might have prompted him to place a deodorant nut in the shoe like a pomander in a drawer of linen. Nut aside, I ventured to the porch to view the dripping wet lake scene before me. For the past few days, I have spooked a sleek black (gray) squirrel seeking white oak acorns in the yard upon opening the door. The door sticks a bit, so it pops when opened and causes the frightened rodent to speed to the safety of the nearest tree. There was no black squirrel on this morning, but a Fox Squirrel occupied the space instead. This too was a bit odd, since the Gray Squirrels outnumber the Foxes in this neck of the northern woods and I rarely see the latter type. 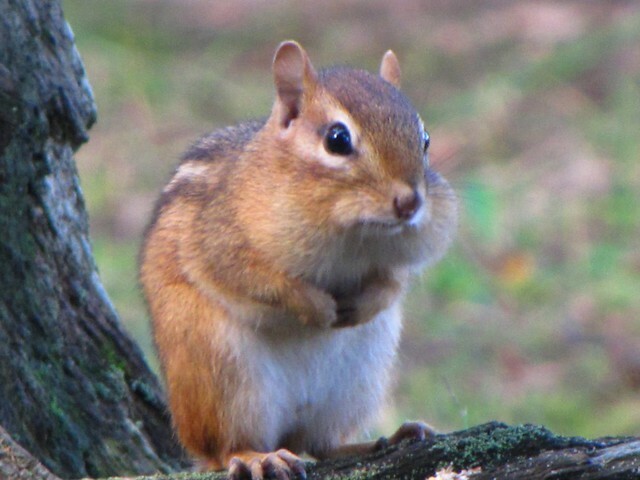 A chipmunk, cheeks stuffed with his share of acorns, gave me an especially guilty glance before dashing off to the shed. Chipmunks always look guilty and nervous, of course, but this one seemed to be suffering from the effects of one too many espressos. Then I noticed it. 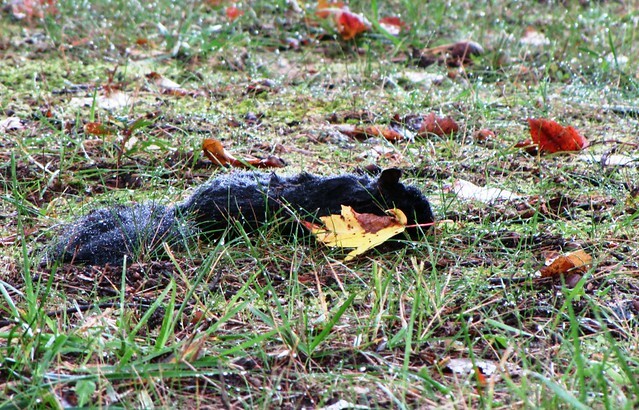 There in the middle of the yard was the still silent form of a dead black squirrel (see below). Anywhere else, this would have been a common sight. The local roads are paved with nut-crazed flattened squirrels, but in my yard only the full formed nut-crazed variety are common. My first thought was that it was shot, but there were no sounds issuing from the neighborhood that morning (no one was really around anyway). The second thought was that it was stuck by a car and crawled to the spot to die, but in order for that to happen it would of had to drag itself over a half mile from the nearest real traffic road in the vicinity. Any squirrel that could drag itself that far with mortal injuries would be worthy of some sort of award (the golden nut memorial award). But in reality, cars don’t usually deliver wounds to creatures such as small delicate black squirrels, they deliver instant death. It looked as if this wet critter landed dead where he lay. I ruled out the fox squirrel as a culprit (and, it goes without saying, the chipmunk and the mouse). If there is antagonism between these squirrel species it is the Gray Squirrels that attack the Fox Squirrels. This left the death issue with two probable causes: lack of co-ordination or predatory influence. Squirrels do fall from time to time. Considering all the magnificent leaps they perform on a daily basis it is a wonder that more of them don’t come crashing down. If distracted by texting then this makes sense, but I know “my” squirrel doesn’t own a phone. The lack of a thumb also rules this out. The final answer, at least what I think is the final answer, was produced by my forensic examination (after completing my coffee break, by the way). This little fellow had two pin prick holes in his hide – one on his thigh and the other in his gut. The gut puncture produced some internal bleeding. I believe this guy was attacked and severely wounded by one of the local predatory birds and either escaped or was dropped from a great height. Either way, we would end up with a dead rodent. The rain probably prevented the predator from recovering its prey, thus leaving me with the second nut-related gift of the morning. Without producing an actual bloody claw, I believe we have our squirrel killer on the strong evidence of motive and opportunity. This was no crime, however. The bird is only to be condemned on its sloppy technique and the squirrel for being edible. Case closed – for now. Probably the last thing I should have been looking for among the giant hemlocks of Hartwick Pines State Park were small things on the forest floor, but I was getting a neck ache. Looking down wasn’t just a relief; it was like bowing in a sacred place. Scattered shafts of sunlight illuminated patches of the forest floor like so many spotlights. One such brightened location contained a small beech tree. Like many of the underling trees with no hope of ever attaining the stature of the surrounding giants, this little beech looked weak and sparse. It stood out – glowed as a matter of fact – not due to a shaft of light but due to a startling coat of white fuzz covering the bark. At first the coating looked like fungus, but it started to move as I stepped closer. There was no wind. The movement was generated by the fuzz itself. More properly, the fuzz was being moved by the swaying motion of the thousands of insects beneath it. Apparently they were attempting to scare me off but the effect was more mysterious and intriguing rather than frightening. It was like witnessing a mass of fairy dancers. These swaying sprites were Beech Blight Aphids. The name is a bit unfair, however. 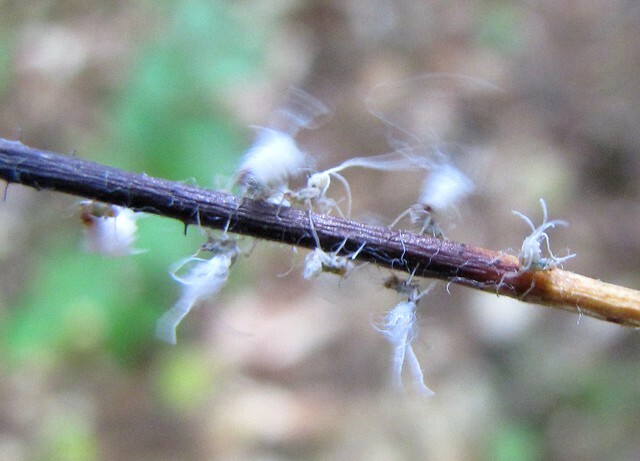 Sure they are aphids, sucking insects of the Hemipteran order which specialize in Beech trees, but their collective actions rarely influence the health of their host tree. 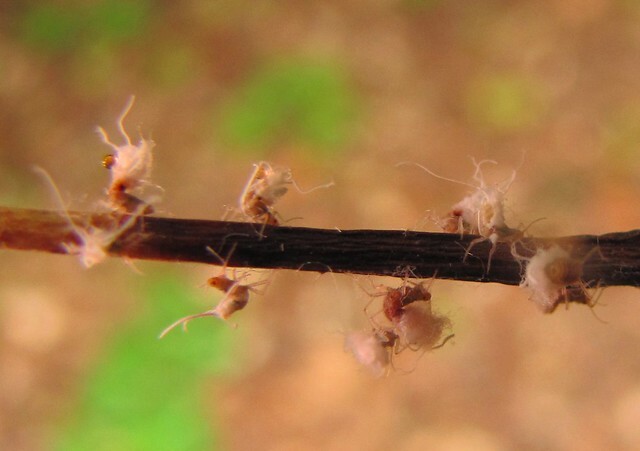 Occasionally an unsightly fungus can sprout from the sticky honeydew generated by an especially large colony but even that is not especially beech-threatening. Some of the less technical names such as Don King Bugs or Flying Mice are much more appealing and fitting (some generations develop wings and can fly – thus the second name). Hopefully I don’t have to explain the Don King reference. 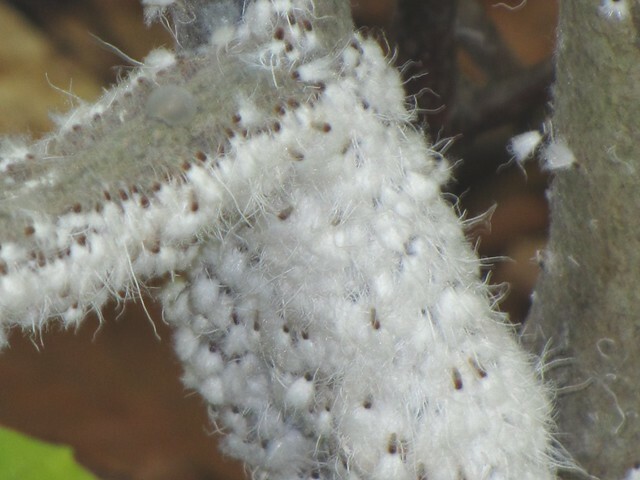 The Don King fuzz covering these peculiar woolly aphids is a waxy creation produced by the insects themselves. They could be compared to wax flowers. In fact, the closest floral resemblance is to the crooked bloom of the autumn-blooming Witch Hazel. As you can see in the photos, it issues out of the abdomen and is held over the arched back like a parasol. The wax plumes are delicate and turn into a fine powder when touched. Many of the insects also had a drop of sticky brown honeydew coming out of their hind end, so any attempt to disturb the bunch resulted in a micro-form of tar and feathering. 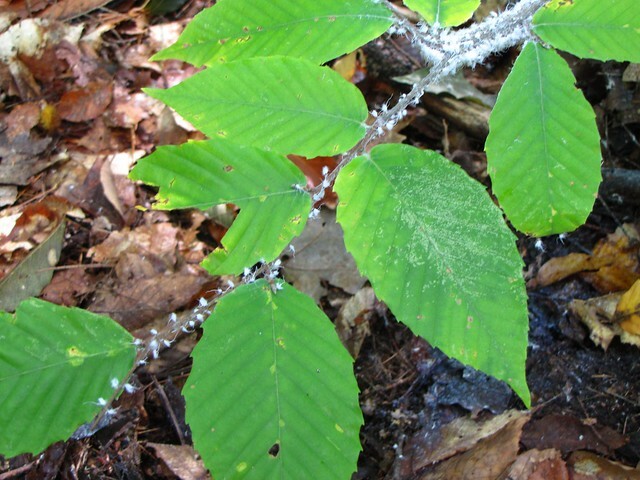 Beech Blight Aphids express themselves in September and October. In spite of their white woolly coating they will not overwinter in this state. By the time a dense layer of icy hoar frost replaces the living autumn frost on this tiny beech tree, the next generation of aphids will be nicely tucked away into the bark as eggs – the seeds of next year’s fairy dancers. You probably noted that within these few paragraphs I managed to compare these creatures to fairies, fungi, boxing promoters, cheerleaders, Witch Hazel flowers, and frost. I do believe that is a personal metaphorical record. Hey, maybe it was the fairy dust!